All pools should have an Emergency Action Plan (EAP), and regular drills should be conducted during the regular season. Below is Murraywood’s EAP, and copies are available in the Concessions Stand. Over the summer, we will be conducting EAP drills on Wednesday evenings. The membership will be notified that a drill will be taking place so that no undue panic will result. During the drills, the pool will be cleared for approximately 20 minutes. 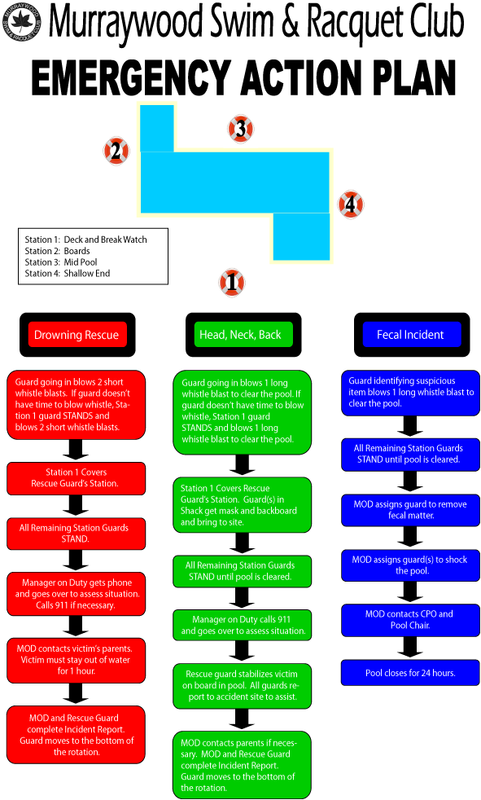 It is important for the membership to know how to respond in an emergency situation – the pool must be cleared immediately so that all guards can come to the assistance of the swimmer in distress. We hope these drills make everyone feel safer!